I’ll never forget the moment I had my breath captured upon my first a glimpse of those sensual curves. Immediately I sensed a dangerous desire coursing through my veins. There was an instant attraction, the sort that normally only occurs in films, but for years I merely looked, adhering strictly to a self-imposed ‘don’t touch’ policy. It worked to a degree, the lack of proximity ensuring I was able to keep my yearning subdued. But last week everything changed. The rules of engagement had been significantly realigned. Opportunity presented itself so clearly that temptation raised its head with such potency that I had no option but to give in to my primal desires. And I’ve not regretted a moment of it. Secrecy became my new watchword as I slipped out for late night liaisons on secluded, country roads, ensuring nobody could act as witness to the pent up release of desire. Position and moment chosen, I softly caressed the leather-wrapped shapes that fell so easily to hand, teasingly getting closer and closer to caressing the button that I knew would turn everything on, transforming the near-silent purr into an appreciative growl. Primed and hot, I rapidly learned what kind of touch provoked different reactions through the body. Each encounter proved more satisfying than the last, increasing the wantonness until we became at one with each other again. My mistress? Jaguar’s beautiful XF. So familiar and accepted is the XF on our roads now that the shock of its Ian Callum-penned modernity back at the 2007 Frankfurt motor show is difficult to recall. Perhaps it was the fact that such an achingly beautiful and contemporary shape had replaced the stuffy and portly S-TYPE that jolted the senses so much five years ago. Since then the range has grown significantly satisfying the specific needs of a wider range of customers in the executive market. 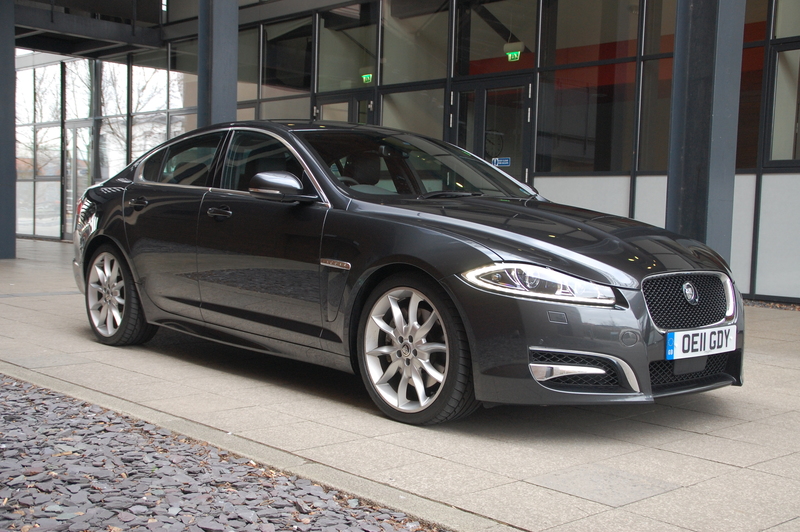 Last year the XF also benefitted from that rarest of phenomena: a successful facelift. Amongst the detail changes, in came an effective new nose, employing headlamps similar in shape to those on the C-XF concept which previewed the eventual production version; their lower edges highlighted by a band of LED day running lights providing an immediately recognisable signature whatever the time of day. 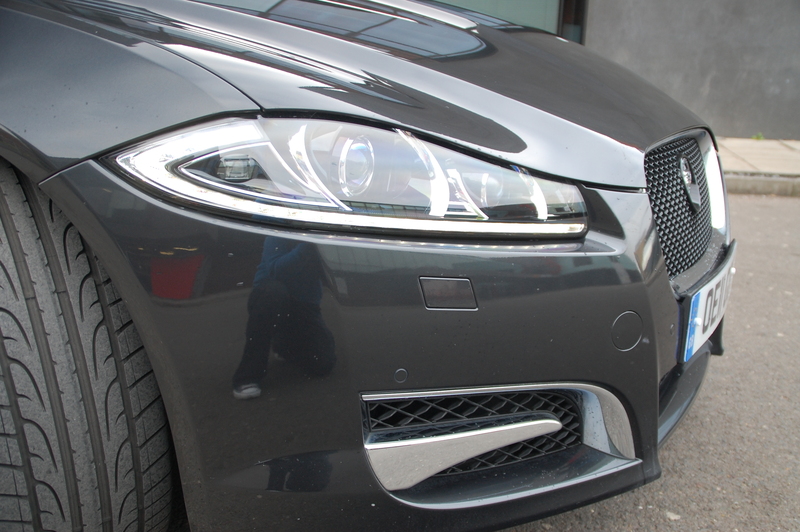 Whilst the XF is bold and modern, it tips a wink to Jags of old with elements of its detailing. The squarer, recessed grille harks back the shock of the new that was the 1968 XJ6; the curvature of the rear door glass has been a hallmark since Day 1 in the annals of Jaguar; and the subtle barrel-sided fuselage mimics the rotund nature of the iconic Mk2. To my eyes, the XF is the best-looking car in its class by some margin. It manages to look unique, elegant, expensive and desirable in a manner that its chief protagonists cannot hope to emulate. Mercedes’ E-Class is too upright and heavy-handed and Audi’s A6 looks like a scaled up A4. Only the BMW 5 Series can hold a candle to the Jaguar’s glamour, yet it somehow manages to not look special enough, wandering too far into mainstreamland to win me over. I wasn’t alone. Everywhere I went I was met with admiring glances and the occasionally mouthed ‘wow’ – it was definitely the XF Factor, rather than my alluring charm. No, honestly, it was the car. In 271bhp V6 Diesel ‘S’ form, the XF is treated to an XFR-style makeover, with discreet body addenda to accentuate the sportiness of the lines. A deeper chin spoiler, black grille finish, pumped-up sill extensions, vestigial boot lid spoiler, enlarged wheels and a subtle ‘S’ badge on the tail suggest a brooding confidence. 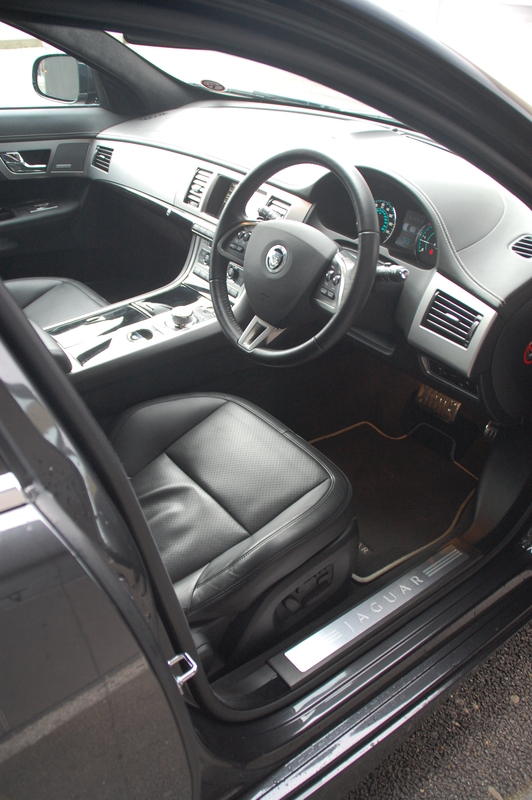 Okay, sold on the styling – does the Jaguar XF’s interior have the same appeal? Step inside and immerse yourself in lounge bar levels of coolness that other interiors simply cannot replicate. In daylight hours, the modernity of the contours and finishes seems a world apart from Jaguars of old. 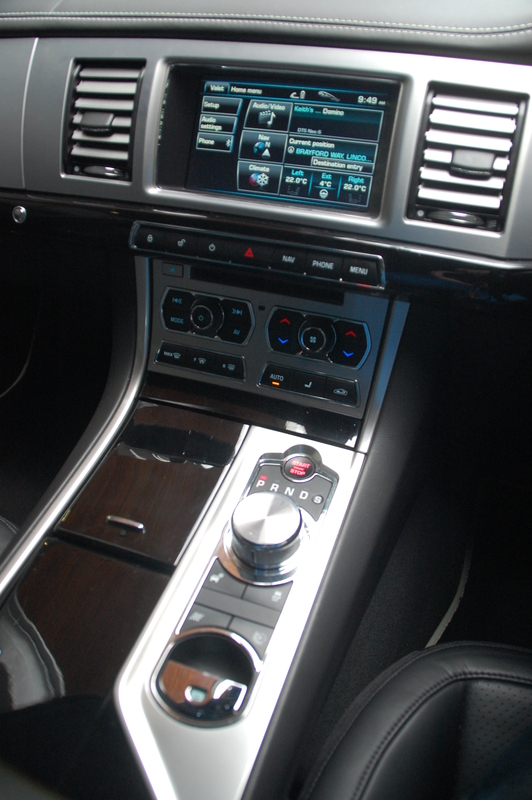 This Portfolio specification XF had a mixture of textured aluminium on the upper dash, with plinths of piano black gloss along the centre console, door cards and a slither across the width of the lower facia. The whole upper surface is swathed in leather, delicately stitched in pale thread. When you’re enveloped in that cosseting driver’s seat, despite the veneer of early 21st Century, the snug nature of the cabin is a trademarked reminder of the feel of Jaguars of yesteryear, most prominently championed by that high and wide centre console. But long gone are toggle switches and the once vaunted J-gate autobox selector and in their places come a series of rubberised switchgear, contemporary touch screen and the effortless coolness that is the rotary gear knob. Not convinced? Try it for yourself. Every passenger who sampled the XF’s cabin for the first time had the face of a child on Christmas morning. First they notice the glowing red starter button, pulsating as though adrenaline is pumping through the Jaguar’s bloodstream. Hold it down, listen to the engine to power into life and watch as the gear lever rises serenely and the dashboard air vents rotate into position, accompanied by a satisfying techno whirr of a soundtrack. At night, the coolness is plummets further into sub-zero territory, all the switchgear back lighting being an exquisitely subtle turquoise. On the doors, the same hue is used for mood lighting, illuminating your resting arm with an eerie beam of light. Reach up to the roof and waft your hand by the interior lights – proximity sensors ensure you don’t have to do something as manually taxing as actually touching the units before they glow brightly. 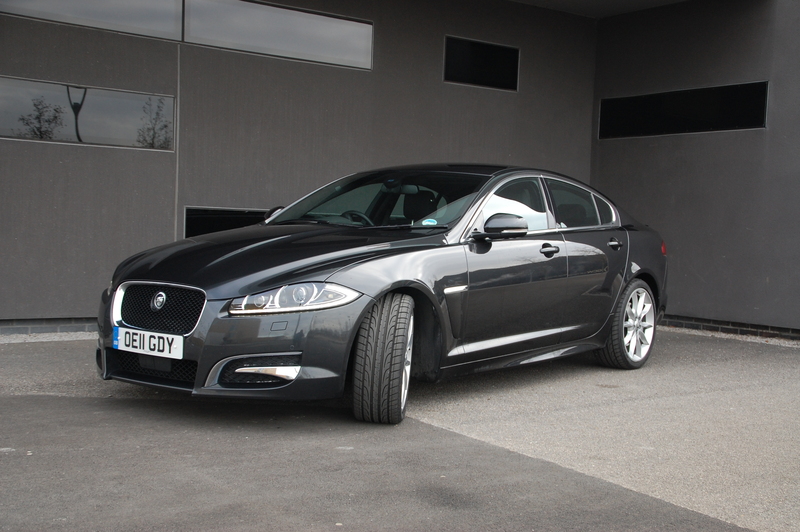 Is the Jaguar XF all style over substance though? Finding a perfect driving position in the XF is a painless exercise, with electric adjustment of the multiway, heated and air conditioned seats, side mirrors and steering column. It feels comfortingly cosy without feeling cramped, although my not abnormally-proportioned size 10 right foot occasionally got snagged under the brake pedal after accelerating. 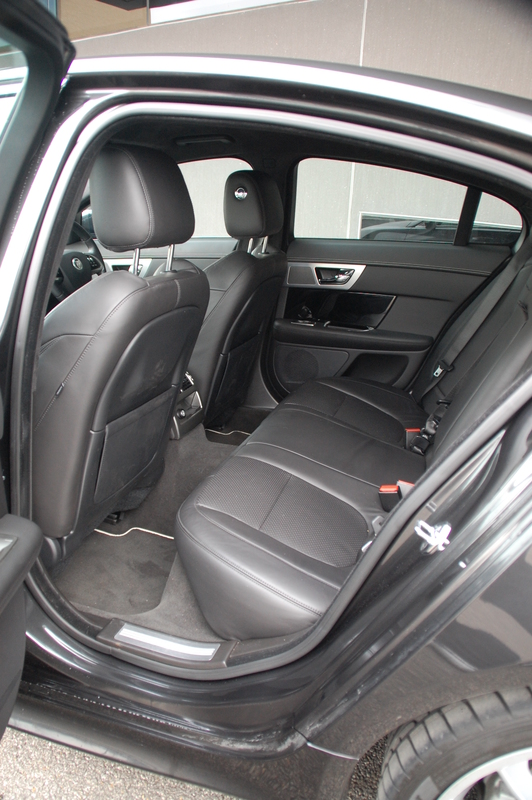 Cabin quality is superb as one would expect in a car costing in the region of £50,000. Inevitably there are harder, cheaper feeling plastics but these remain the domain of areas typically where your hands are unlikely to explore. The remainder feels and looks great as well as being solidly constructed. Everything felt tight, robust and rattle free. Rear space is more generous than that coupé-like roofline suggests it might be and whilst three adults can sit side by side in relative comfort, the XF is considerably less spacious than its Germanic rivals. Whether you can forgive the occasional knee being pressed into the seat back from taller rear occupants is a matter of preference but all cars require a compromise in one way or another. If out and out spaciousness is a primary buying factor, then you probably best aim straight for the showroom with the three-pointed star outside. That aside, packaging has to be improved for the next generation XF if Jaguar is to continue its recent momentum. It’s a similar story in the cargo hold where the boot aperture is narrow and the height of the loadspace isn’t particularly deep either. 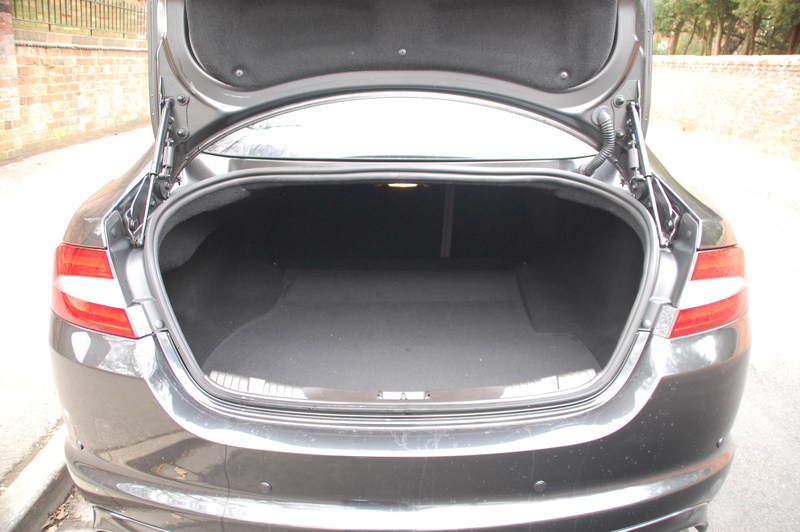 Frustratingly, although the boot itself is long and the rear seatbacks split-fold, the floor isn’t flat. In many ways you can forgive this drawback for the overall stylistic beauty but far less acceptable is the cheap carpet moulding crudely attached to the inner boot lid. It’d look out of place on a car costing 20% of the XF’s price tag. All that modernity can’t come cheap though. Is the XF expensive? Portfolio specification is in the upper echelons of the XF hierarchy and it’s suitably equipped to an impressive level. Aside from the warming and cooling leather chairs, you’ll also benefit from Bluetooth connectivity for phone and music, heated steering wheel, dual-zone climate control, automatic lights (including the main beam), satnav, reversing camera and a very effective radar cruise control system. Jaguar’s current smallest model since the demise of the X-TYPE is now available with a broad range of predominantly diesel powerplants. The four-cylinder 2.2-litre diesel comes in 161bhp and 187bhp states of tune, both averaging 52.3mpg and 149g/km of CO2. 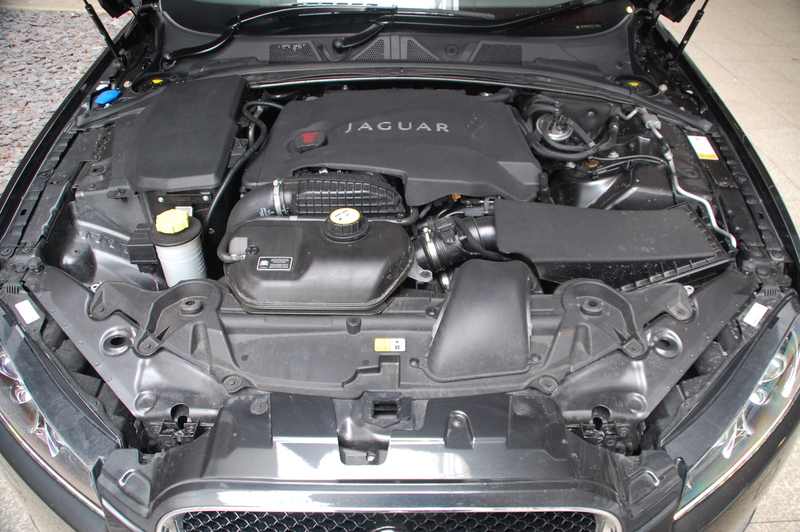 The larger V6 3.0-litre units, both much improved versions of the earlier 2.7-litre twin turbo, come with 237bhp or 271bhp in the ‘S’ format tested here. All diesels are fitted with an incredibly smooth and flexible 8-speed automatic transmission. If you’re not a diesel fan, you’re going to have to dig deep for a petrol-powered model. And not just in the showroom but on the forecourt too, as you have a limited selection of a 5.0-litre V8, either naturally aspirated or supercharged in fire breathing XFR form, both of which are mated to 6-speed automatics. 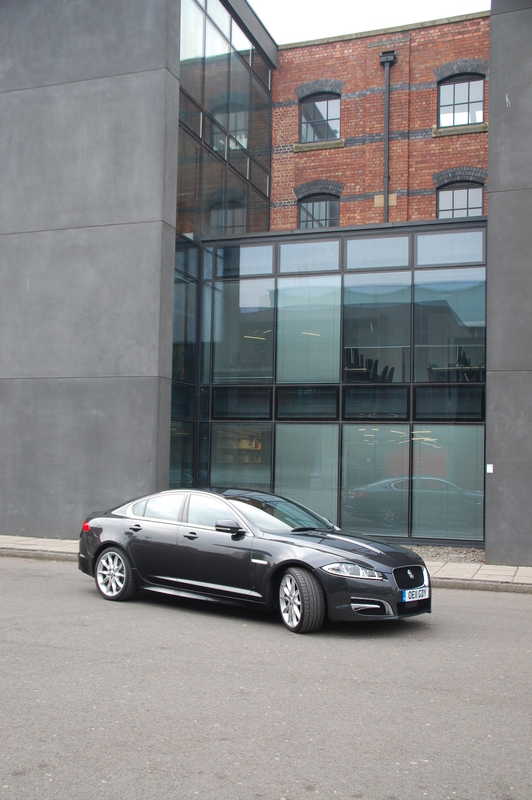 XF ownership begins at £29,950 for the 161bhp 2.2 Diesel SE soaring up to £65,350 for the XFR. Of the three German alternatives, only the Mercedes-Benz E 200 CDI has a lower entry point at £29,120. With looks like that, does the XF deliver on the road too? Jaguar have long produced models which have fine reputation for performance and amazingly supple rides, if not always outright handling prowess, but the XF has been extensively fettled to address that shortcoming. Does it matter that the Jaguar cannot quite match the Teutonic, clinic efficiency of the benchmark 5 Series? Probably not for the majority, because what the XF engineering team have retained is a healthy dose of fun that can only be provided by an engaging rear drive chassis. Rather than trying to dial out all of that character and sanitise the experience, the Jaguar remains an entertaining rather than efficient prospect. Flooring the throttle from a standing start delivers an ocean wave of torque that even with the traction control system firmly engaged, still allows the enormous rear wheels to spin, sending engaging vibrations through the cabin. You can hear the tyres scrabbling on the asphalt for a second or two before the tread of the sticky, low profiled rubber finally gets a purchase on the road and you’re propelled forward with a sports car-like urgency. Show the XF a demanding series of bends and immediately you know you’ve opted for an endearing package. The meatily weighted steering telegraphs all communication regarding angle and grip superbly, uncorrupted by that mountain of 442lb/ft torque. Instead it still permits you to be a little lairy through the twisties, the tail stepping out in appreciation of the throttle and steering inputs. Yes, the traction control’s there to save your blushes, but what’s on offer feels safe and predictable once you’re used to it. Switch it off (yes, hold the button down for 10 seconds as demonstrated in that recent Top Gear feature) and yet more breakaway is on offer but at a level that is manageable enough to remain controllable but sideways enough to be satisfying. That sounds fun, but the XF’s ride must be compromised as a result? The XF doesn’t have to be all about tail-out happiness and the reality is many executive class car buyers are looking for serene transport in which to gently cruise so as to exhibit and relax in their wealth. Here, the Jaguar still delivers. In spite of enormous and beautiful 20” alloy wheels and skinny side walled rubber, the legendary Jaguar ride comfort is still there. Doubtless, losing an inch or two from the wheels’ diameter would make it even better but never do you feel that the quality of the ride has been spoiled. Yes, on particularly rutted roads the bumps are more noticeable but the chassis never grumbles and neither will your passengers. I’m really tempted, but I’m still not comfortable. I mean, a diesel Jaguar? It’s not right. There are only two regular events in XF ownership that’ll remind you that you’ve specified a diesel version: the first is that inevitable cold start clatter, but in this application it’s so subdued and over so quickly that you genuinely only notice it if you’re specifically listening for it. Not a single passenger over the week of the test noticed it was a diesel until I pointed it out and even then not all believed it. Similar scenes of disbelief are seen at the fuel station. Slotting the nozzle connected to a black hose into the fuel filler is the only other occasion you’ll remember you’re driving an oil burner. So incongruous for many is the sight of a beautiful car being brimmed with something other than petrol that you can see others in the queue behind you wincing as though you’re about to make a terribly expensive mistake. The only place you’ll find a ‘diesel’ badge on the whole body? On the yellow sticker on the inside of the fuel flap. To put it into context the remarkable qualities of the twin-turbo diesel engine, it seems fitting to conclude on the performance figures. Top speed is limited to 155mph but such is the relentless delivery of urgency from the engine that you know there’s much more in reserve. That said, whilst the XF V6 Diesel S accelerates rapidly, it didn’t quite feel as quick as the 5.9 second claim to 60mph suggests, not that there was an opportunity to test it out against the clock. But it is quick enough to feel like you’re being catapulted at great velocity into the middle distance and that alone is still enough to induce a big grin. Whilst outright performance is one thing, diesels have a reputation for being economical. With those raw speed statistics a 44.8mpg claimed average on the combined cycle might appear to be a figure laced with more than a little artistic licence. Not at all. A rapid, two hour long motorway cruise suggested 38mpg on the central LCD dash display, with a more gentle trundle across country lanes actually bested the official claim. Maybe, just maybe you can have it all. Rarely do you come across a car that ticks so many boxes that giving it up after a week-long test feels like a wrench, but the XF is one of them. Without doubt, anyone looking to spend between £30,000 and £60,000 on a premium car, capable of carrying up to five people and their luggage in comfort would be foolish to not get themselves down to their nearest Jaguar showroom and experience the XF. It’s a car that gets wholeheartedly recommended, its drawbacks minor in comparison with the majesty of its qualities. If I had the money, would I buy one myself? In a word… no. You see, for all the XF has made for an exciting affair, I’m a sucker for a curvier rear end. Those coupé-saloon lines are glorious but just not quite enough for my particular wants and needs. 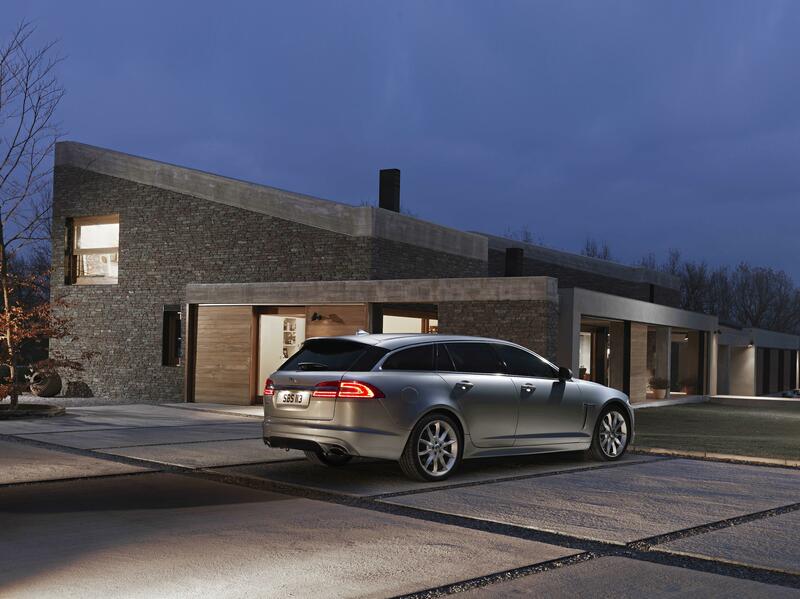 Jaguar must have had me in mind, because this week the marque will introduce the XF estate, or in Coventryish, the Sportbrake. 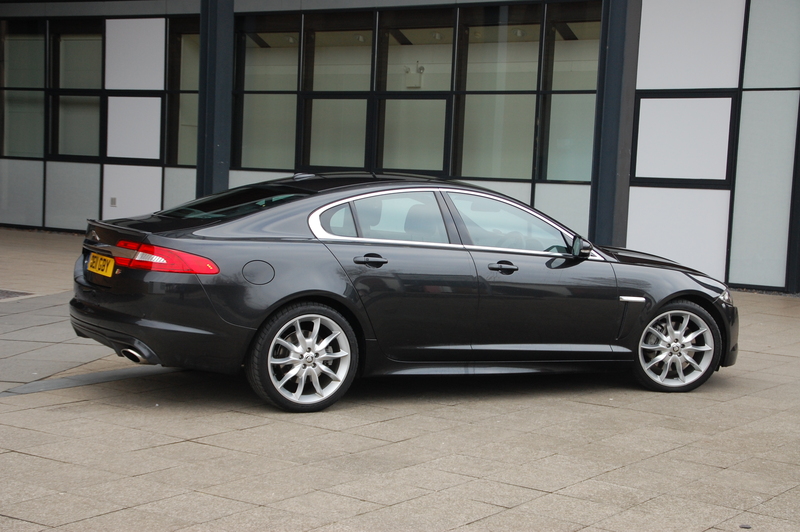 That is the XF I’d elope with. Great review! Ordering one in next few weeks. Can I ask what the colour of your car is, that is the colour I want. Is it status grey? Yes always a downer along the line, Like the XE has garden wheelbarrow handles for the exhausts pipes.